Miami might not be top of mind when traveling with kids... by why shouldn't it be? Kid & Coe - the booking site for family-friendly house stays around the globe - has become my go-to travel resource of late. Ever since our apartment rental in Rome I'm completely sold on the concept of renting a home. If you plan to be at your destination for any length of time, a home will be much more accommodating to little ones and teens than a hotel. Warning: this swanky Florida pad might just be too hot to handle. 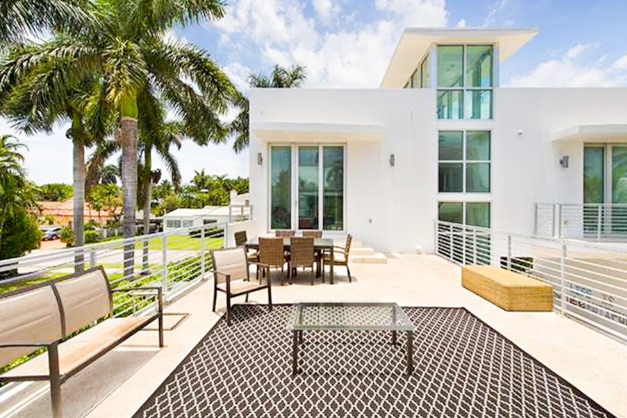 Jet skis, a separate villa for extra guests, modern interiors and a chef's dream of a kitchen, this Di Lido island residence sleeps up to 14. Yes, that's an infinity pool and the sleek three-story house has an elevator too. Gaze out at downtown Miami while sipping your morning OJ in that massive bath tub. I die! Hello, nighttime excitement and incredible daytime fun. Why is a house stay such a win for families? For one, you can really settle in for your stay. A home allows for entertaining, preparing home cooked meals (or hiring a chef), enjoying your own schedule and really customizing your schedule. And finding the right residence continues to get easier with sites like this one gaining traction. But back to this fabulous waterside Miami home... flying south for the winter is starting to sound like a very, very good idea. While your brood of minis might not have the same affinity for Art Deco buildings and rooftop sushi, I assure you this south Florida destination has something for everyone. Besides... you've got an infinity pool. What more could a kid ask for? See this and other destinations at Kid & Coe. Happy traveling!